The Coyote football team tore into the turf of their new outdoor practice field north of the DakotaDome on March 20. 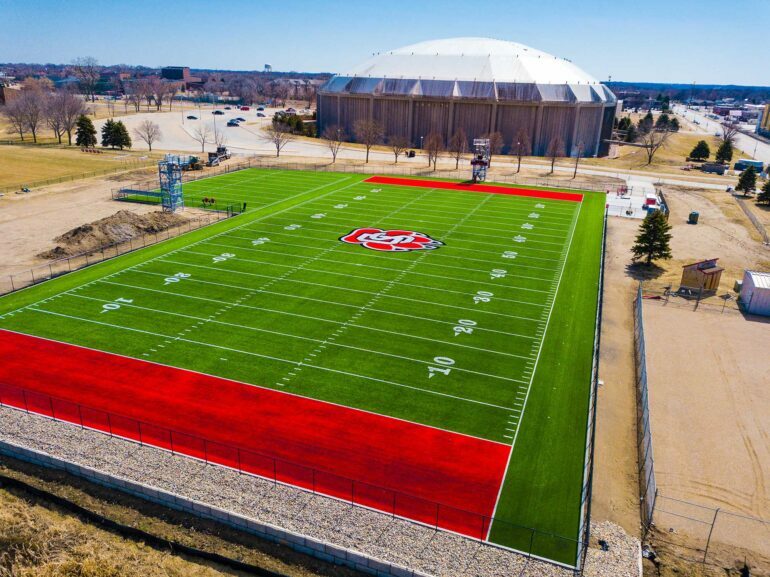 The Coyotes have 15 spring practices scheduled outside on the field, an aid for when they play teams outside the weather-free confines of the Dome throughout fall. “Training outside gives you the opportunity to play in different weather conditions to prepare for away games that aren’t played in our dome,” redshirt -freshman outside linebacker Trevor Shohoney said. USD travels to Western Illinois and Missouri State in October and November, both teams who host an outdoor field. However, the varying weather means players must adjust how they prepare and what they wear for practice. “Since practice is outside now, the only big change is having to practice when it rains and in the cold,” junior linebacker Jacob Matthew said. “Previously, weather that was too cold, windy, or rainy, would mean that we would just stay inside. Now, we have to go outside and wear the proper apparel. Fortunately, we’ve had beautiful weather this spring, so we don’t have to wear much more than a long-sleeved shirt,” junior linebacker Jacob Matthew said. The new facility was completed and ready for use just as DakotaDome renovations began in February. As the renovations take place no teams can practice in the Dome, forcing teams to practice outdoors or at a different facility. The Dome floor will be ready for football this fall, but the west side will not have any seating, moving the student section to the same side as the general admissions. The Dome will have roughly 5,000 seats available this season. Players are still learning how to work with the challenges that come with the new facility and the Dome renovations, which neighbors their locker rooms, weight room and training rooms. “There is no convenient way to access [the field] from the Dome,” sophomore outside linebacker Brady Booker said. The team is also adjusting to the difference between the types of turf. The new facility has a different turf that the players have not practiced on much, if at all, before this spring. Due to the Dome renovations, there will not be a spring game this year. The team is opening practices to the public April 6 and 13.